Mystery on the Desert was a 30 minute programme in black and white in the Adventure series created by David Attenborough. The film was made by Tony Morrison and Mark Howell with a colleague Allan Reditt acting as business manager and asssistant. The production company was Nonesuch Expedtiions. 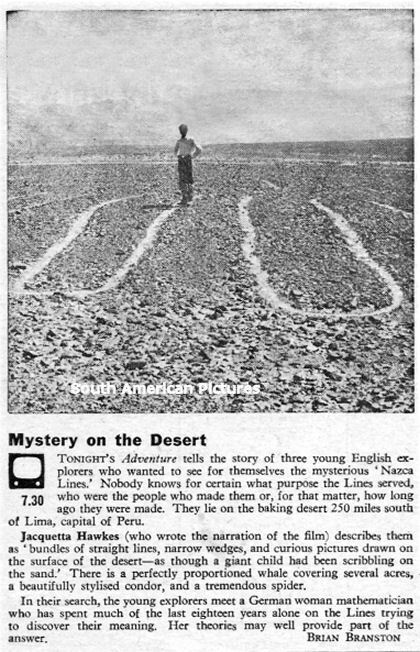 This was the first televeison film to feature the Nasca [Nazca] desert markings and to introduce Maria Reiche to the world. The commentary based on a script by Mark Howell was written by Jacquetta Hawkes the archaeologist wife of acclaimed author J.B Priestley.